Step on board a Silversea luxury cruise ship and sense how time pauses – letting you breathe. Now imagine a schedule free to fill with all that is close to your heart, a world of earthly delights at your fingertips and a crew dedicated to your every whim. Breeze through embarkation then step aboard into the warm welcome of a white-gloved staff on your luxury cruise. A flute of champagne is exchanged for your hand luggage as you are escorted to your suite. This is just the beginning of your luxury cruise experience in a world where your every wish is anticipated and fulfilled with earnest precision. No detail is too small. No request insignificant. All Silversea crew and staff offer genuine hospitality and the utmost in professional service – a fine art that is at once highly attentive yet never obtrusive. The Leading Hotel Schools of the World provides training for staff members, to ensure the incomparable level of personalised attention Silversea guests deserve and have come to expect on board their unparalleled luxury cruise. All Silversea ships maintain a staff-to-guest ratio of nearly one to one. Silversea’s suites offer one of the highest space-per-guest ratios of any luxury cruise accommodations. All Silversea suites have ocean views, and most include a private teak veranda so that you can breathe in the fresh sea air simply by stepping outside your door. And regardless of the ship or suite category, all guests will be pampered with the personalised services of an attentive butler. For a truly personal experience, customise your suite with an abundance of thoughtful options and luxurious amenities from Bvlgari toiletries and personalised stationary to a bar with your favourite wines and liquors. Settle in with a complimentary movie or choose instead to simply watch the ocean swim by. You can even have dinner in-suite served course by course by your butler. Then, when it’s time to retire, curl up beneath Egyptian cotton linens and a fluffy duvet, with your choice of nine different pillow types. The ultimate in luxury cruise accommodations, Silversea’s suites are your home away from home. Enhance Your Cruise. Enrich Your Life. Discover enrichment cruises with Silversea. Whether your interests lean toward history and culture or you love the great outdoors, enrichment is a fundamental component of every Silversea voyage. The Silver Perspectives programme includes lectures, informal talks and demonstrations to enrich your understanding of the lands you visit, and the people who live there. Discover fascinating aspects of the local lifestyle – past and present – as celebrated guest speakers, noted historians, celebrity chefs, bestselling authors, destination consultants and world affairs experts share their special insights into areas of the world they know intimately. Ahh … those heavenly days at sea, when time, at last, is finally on your side. Especially when there are so many stimulating activities to discover on board your all inclusive cruise. Silversea provides meaningful and authentic travel experiences by offering unique insider insight on popular attractions as well as exciting discoveries of the unusual. The Silver Shore programme offers a comprehensive array of customised tours, shore excursions, and special services so that Silversea guests can fully design their time ashore. Explore the world from a more personal perspective aboard the ships of Silversea. An onboard team of Silversea Destination Consultants are experts on the local history and culture, regional customs and experiences not to be missed. True specialists, their insider knowledge allows you to become fully immersed in the destination, from on board to up close and in depth. Preferred shops in select ports guarantee your new Turkish carpet, Venetian glass and Bvlgari atelier purchases are of the highest quality. The ease of enjoying a night on the town is one of the great benefits of an all-inclusive cruise. Especially when just steps from your door you can mingle with the interesting, international guests who prefer Silversea ships. Begin with a cocktail at one of the bars where a lively crowd has gathered to trade tales of the day’s adventures. How relaxing to know nobody need reach for the bill. The friendly conversation continues during dinner where you can linger over coffee — but don’t miss tonight’s performance. In the Show Lounge, an expectant hush gives way to applause as the curtain opens on an energetic production show or with a celebrated pianist you’ve seen on TV. If you prefer, try your luck at roulette or take in a movie under the stars. And if you’re a dance aficionado, you will not be alone. Dance hosts are available on many Silversea cruises. Or take a quiet stroll out on deck and let the romance of the sea work its magic. Terms & Conditions: Unlimited internet access is available for guests booked on voyages departing on or after January 1, 2016 in Medallion, Silver, Royal, Grand, and Owner’s suites aboard Silver Cloud, Silver Wind, Silver Shadow, Silver Whisper, Silver Spirit, and Expedition, Medallion, Silver, Grand, and Owner’s suites on Silver Explorer, Veranda, Deluxe Veranda, and Silver suites on Silver Galapagos, Vista, Veranda, and Medallion, on Silver Discoverer. One hour internet access per guest/ per day applies for those guests booked in Vista, Terrace, and Veranda suites on Silver Cloud, Silver Wind, Silver Shadow, Silver Whisper, Silver Spirit, Adventurer, Explorer, View, Vista, Veranda aboard Silver Explorer, Explorer, and Terrace suites on Silver Galapagos, Explorer and View suites on Silver Discoverer. Additional internet packages are available for purchase. WiFi service is not guaranteed. 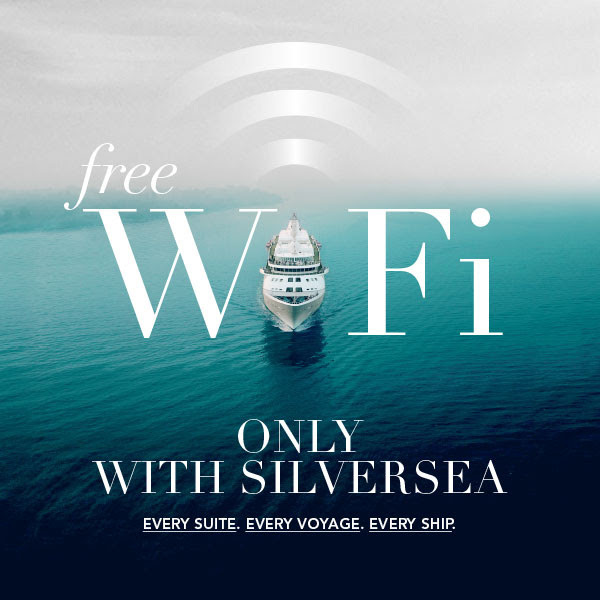 Silversea is not responsible if WiFi service is not available. Silversea reserves the right to correct any errors or omissions.